When you have a negative feeling, the thought of comforting and drowning yourself in food sounds like a wonderful idea. Your mind will be taken off of dealing with your emotions and food will heal all. This is the truth for about the first five minutes of binge eating. After that, you will continue to eat, but not because you are hungry. You will start to notice that your original feelings of sadness or other reasons will come back, along with new feelings of guilt because you just consumed so much food. Is there a way out of this crazy cycle? Of course there is! Here are five steps that you can start implementing into your daily life to conquer a binge. The first step is to feel deserving of yourself. You need to feel that you are worthy enough to change your binge eating habits. Only after you do this and improve your self-esteem can you win the war over Binges Eating Disorder. The second step is to throw out all foods in your house that you like to binge on. Remember, if the food is not readily available to you, it will be harder to binge. This also means when you go grocery shopping. When you don’t purchase foods that you binge on, it will be easier to conquer while you are at home. You want to make it as hard as you can. The third step is to buy a journal. In your journal, you are going to record all binges and what feelings were present during the binge. Record all details including the time, day, what you ate, how much you ate, and how you felt before and after the binge. Journaling is a great tool because this will provide insight to you as to why you turn to food like you do. This will help to narrow down your binges so that you will be able to see any similarities that happen when you binge. The fourth step is to find a way to relax yourself. This is most important to do when you feel a binge coming on. Relaxation is very important in clearing your mind and turning away from the binge. Listen to nice, classical music, take a warm bubble bath, pamper yourself, go for a walk on a nice day, mediate, or picture yourself somewhere else where binging isn’t a part of your life.Another thing that you can do for relaxation is to go for a nice drive. Maybe you live by the ocean or a lake. Maybe you have some great scenic roads. Just remember not to take any money with you and try not to drive by anywhere that has food. 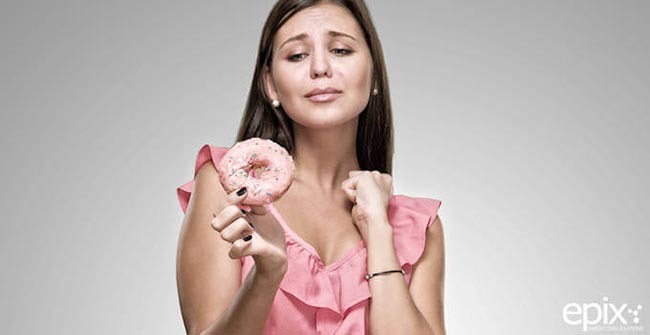 You want to make the binge go away and you don’t want to be tempted to give in. The fifth and final step to stopping a binge is to talk about it. Talk to a friend or anyone else that you can trust about how you are feeling. If you are upset, vent your frustrations out to them. Just having someone listen will be very helpful to you. You will feel that a weight has been lifted from you after you get everything off of your chest.